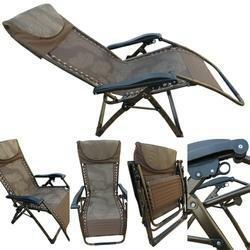 Prominent & Leading Manufacturer from Surat, we offer folding gravity recliner chair-extra wide-02ck, folding gravity recliner chair-08c, folding gravity recliner chair-09c-brown, folding gravity recliner chair-09cb-grey, folding gravity recliner chair-extra wide-06ck and folding gravity recliner chair-03c. Size OVERALL - 177 x 70 x 116 Cm. Height. frame : powder coated round tubular mild steel frame. fabrics : high quality textylene. unique, easy and secured locking mechanism which does not permit to slide from the locked position of the chair without unlocking. 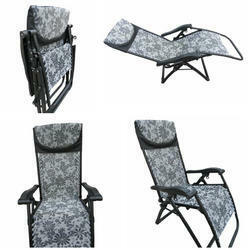 high quality powder coat finish on steel frame smooth & steady movement while reclining the chair. better quality wider arm rests. 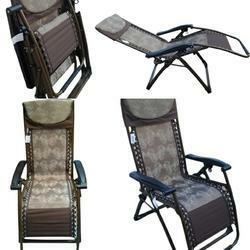 compact design highly comfortable to use while watching t. V, reading, sleeping. weight capacity - 131 kg. dimensions : overall - 177 x 70 x 116 cm. Height. , seat : 156 x 48 x 48 cm. Height. Folded : 65 x 14 x 96 cm. DIMENSIONS : OVERALL - 177 x 70 x 116 Cm. Height., SEAT : 156 x 48 x 48 Cm. Height. FOLDED : 65 x 14 x 96 Cm. Size 177 x 67 x 117 Cm Ht. 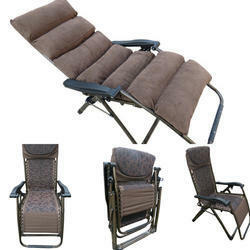 Smooth & easy reclining mechanism provides almost sleeping body posture. Added comfort of full length padded seat. 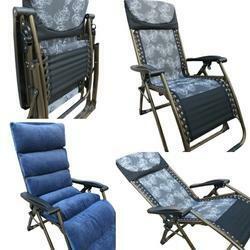 Materials Used - SEAT - High quality Textylene fabric. FRAME - Powder coated round Tubular Mild steel frame. CUSHION - Velvet fabric stuffed with micro fibers. 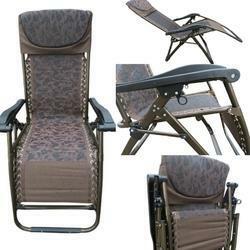 Padded seat is detachable. Can be fixed whenever needed. 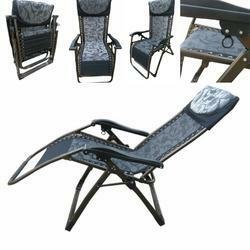 Key Features : Unique, Easy and Secured locking mechanism which ensures locked position of the chair till not unlocked manually. High quality powder coat finish on steel frame. 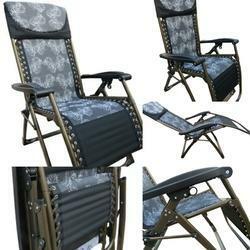 Long lasting powder coat finish on frame and better fabric quality. 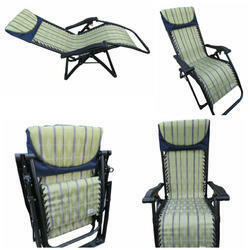 Dimensions : OVERALL :177 x 67 x 117 Cm Ht., SEAT : 157 x 50 x 49 Cm. Height.. Weight - 10 Kg.